We have recently been increasing the veg to 6 cups and leaving out the chicken, to make this a cheaper meal. To make it a completely vegan meal we simply leave out the meat and double the mushrooms. *We prefer to eat Brown rice, but if your family prefers white, go with Basmati. 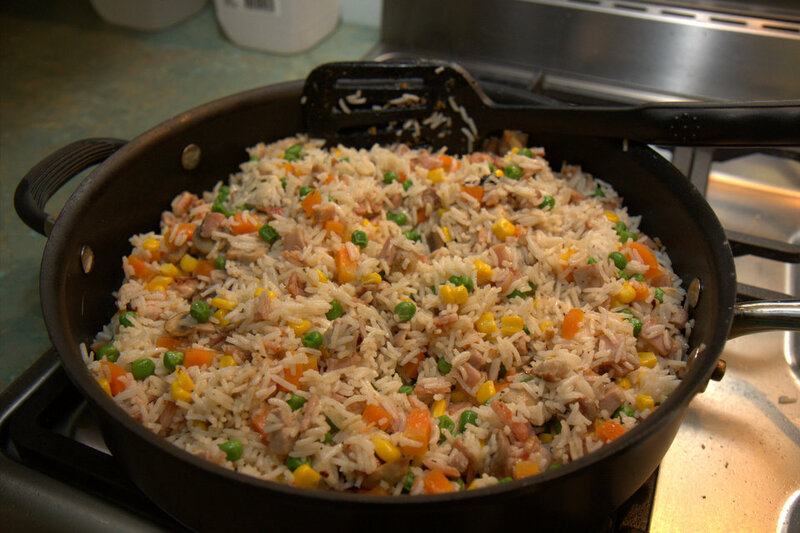 The night before (if possible, but even a couple of hours before is ok), cook the rice so that it is just tender, rinse and drain it well, then spread it out evenly in a baking dish and refrigerate. Heat the oil in a large frying pan, add the onion, chicken and bacon and cook for a few minutes. Then add the ginger and aminos. Cook until the chicken is browned, then add in the sliced mushrooms. Continue to cook, stirring, until the chicken is cooked through. Separately, steam veggies and keep aside. Just before dinner (if you’ve made up to this point in advance), reheat meat in the frying pan, add rice, stock and warm over low heat for a couple of minutes. Stir in meat, mushrooms and veggies. If your diet allows, you could also mix through some fried and chopped up egg. It takes a few minutes to all warm through. This quantity easily makes 2 meals for all 6 of us. no, I’ve never tried that one. I’ll give it a go next time – thanks! Reblogged this on Itchin' Kitchen.